President Clinton wants to hear from YOU on the topic of global education – what would you #AskClinton? The inaugural Global Education and Skills Forum in Dubai March 14-17, is bringing together global leaders to tackle education solutions for the approximately 139 million children who are missing out on schooling worldwide. During the world leaders including Bill Clinton and Tony Blair will be discussing private-public partnerships to improve education equity. Former President Clinton will deliver the keynote address and will answer questions from Twitter in partnership with Varkey GEMS Foundation, a nonprofit that empowers underserved children worldwide, for which he serves as honorary chairman. 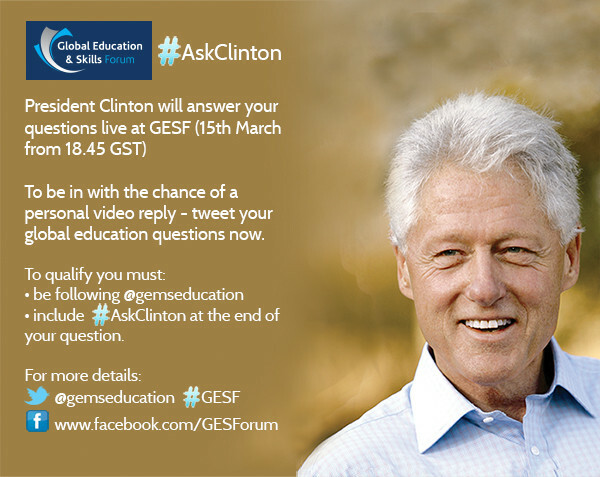 Send your tweets using the hastag #AskClinton (you must follow @gemseducation). He will answer questions LIVE via video from the Global Education & Skills Forum on March 15th. "Education is much more than a series of goals that a nation sets as it aspires to build peace and sustain a knowledge economy. Education is a human right that eludes hundreds of millions of the disenfranchised. The power of the human mind makes possible all of humanity's achievements, from health advances and agricultural innovations to efficient public administration, private sector growth and respect for human and cultural values. Yet millions do not have the means to achieve for themselves the basic tenets of education; the ability to read, write and provide for their families. For countries to reap the benefits and power of an educated citizenry, they need to find sustainable approaches and build partnerships that will enable them to provide access to continued and effective learning". You can access the full GESF agenda online: http://bit.ly/YuvOJv and share this post to spread the word.